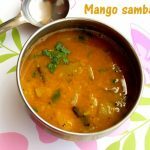 Drumstick sambar or murungakkai sambar is a traditional south indian curry using drumsticks, lentils and indian spices. 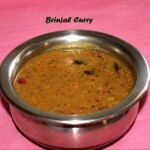 It is a very essential and commonly used side dish for rice, idlis and dosas in South India. 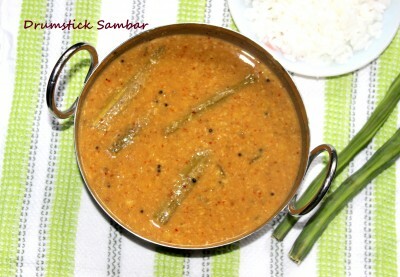 Drumsticks added to sambar gives a sweet and unique flavor to the dish. Drumsticks are said to be the blood purifier and has a high content of antibacterial properties and helps in preventing infection in the throat and skin. Cut the drumstick into medium pieces about 2 inch long and boil with little water for 10 to 15 minutes till they become soft. 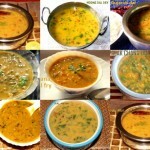 Boil tur dal with enough water and turmeric in a pressure cooker upto 4 whistles or boil separately in a vessel till soft. Once cooked, mash the dal and keep aside. For tamarind water, boil a lemon size tamarind in water for 7 to 10 mins. Once it cools down, take pulp out of it and add little water. 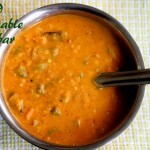 Stir fry the ingredients given for sambar masala and grind with little water to make a smooth paste. Heat a pan. Add tamarind water. Let it boil for 2 to 3 minutes till the raw smell of the tamarind exudes. 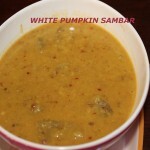 Add the ground sambar masala and cook for 2 minutes. 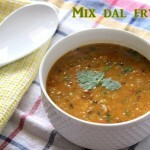 Add boiled tur dal, boiled drumstick pieces, salt and little water to bring to a medium consistency. Mix well and let it simmer for another 5 mins. 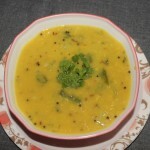 Serve hot with rice or idlis or dosas.